Ten years on from his overrated, pimped up powerpoint lecture An Inconvenient Truth, eco-huckster Al Gore is trying to tell anyone who’ll still listen how he (almost) singlehandedly saved the world from ManBearPig. And some of them actually believe him, like the fawning journalist who wrote this Wired interview. Yet this year Gore and his fellow activists have a rare reason to celebrate. In April, 175 world leaders gathered at the United Nations to sign the Paris Agreement, a global pact that aims to keep global temperatures from rising more than 2 degrees Celsius above preindustrial levels. 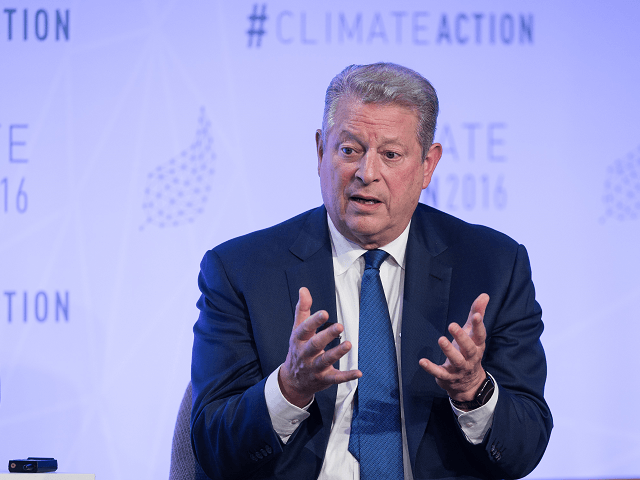 Now, a decade after his movie sounded the alarm about climate change and 16 years after he ran for president, it looks like Al Gore might finally be … winning? Gore is understandably eager to agree that yes, all those airmiles he’s racked up in his private jet, flying back and forth across the world lecturing people on how to rein in their carbon-guzzling lifestyles, really have made a difference. The Paris Agreement must feel like a big point of progress. It really does. Sometimes in sports you can sense a palpable shift in the momentum of the contest. A team will be behind on the scoreboard, but the shift in momentum is so obvious and dramatic that you just have the feeling they’re going to win. That’s where we are in solving the climate crisis. We’re still behind on the scoreboard, but the momentum has shifted. We are winning. Really? Not according to this brutal new assessment of the Paris climate talks by a leading expert on international law produced for the Global Warming Policy Foundation. Professor David Campbell of Lancaster University Law School says that the Paris Climate Agreement is nothing more than a blank cheque that allows China and India to burn as much carbon dioxide as they like in pursuit of economic growth. It will do little if anything to secure a reduction in global CO2 emissions – not least because it gives the world’s biggest polluter a free pass. Everyone involved in the climate negotiations knew this all along. China and India were never going to sign without this let out clause. But it suited the COP21 organizers not to mention this embarrassing detail when crowing about the success of their summit. Professor Campbell reserves the most scathing part of his report for the UK government, especially its Committee on Climate Change. The Committee on Climate Change is the cadre of environmental zealots – several with interests in the renewables industry – led by Lord Deben, whose raison d’etre is to ensure that the UK government cleaves to its carbon reduction commitments, as set out by the disastrous Climate Change Act. But the advice the Committee is giving the government, Professor Campbell argues, is technically and scientifically unsound. The UN has formally adopted an objective to limit warming to 2◦C and is working towards an agreement aimed at peaking and reducing emissions consistent with this goal. . .Progress towards a global deal has been slow but broadly as expected. The key challenge is to get agreement on global emissions pathways to 2030 compatible with achieving the climate objective. The Durban Platform provides the opportunity to address this challenge, with the aim that agreement is reached in Paris by the end of 2015. Recently it restated this alleged 2◦C objective, claiming it had been endorsed by the Paris Agreement. This, Professor Campbell notes, is “completely wrong”, represents a “profound misunderstanding” of the Paris Agreement, and thus represents “extremely poor” advice.